At first glance, factory or manufacturer warranties sound fairly straightforward. After purchase, the manufacturer will cover any repair and replacement costs for a certain period of time, such as five years and 500,000 miles for a vehicle or three years and 10,000 hours for a machine. In many instances, the warranty provides enough coverage. However, it becomes more complex when managing service contracts for large fleets of heavy equipment and vehicles. Tapping into vehicle and asset telematics data helps to track important warranty information. Construction equipment and other heavy vehicles must regularly operate under stressful conditions, making it more likely for them to experience a failure. In addition, they are also vulnerable to a range of other threats, such as unauthorized use that may fall outside the warranty. Fortunately, telematics systems, such as AssetOutlook™, allow equipment operators to keep close track of any problems and stay on top of maintenance needs, helping to make the warranty management process simple even for large fleets. Although most construction equipment and vehicles are built to withstand harsh environments and difficult conditions, parts will occasionally fail from not being maintained or due to a design flaw. If this happens within a warranty period, the manufacturer typically covers the cost of repair or replacement. But what happens if a part fails repeatedly, or right after the warranty period ends? What if the failure of one part causes further equipment damage elsewhere? Warranty management can get tricky. In order to convince a manufacturer to repair or replace a defective part after the initial warranty period, or to pay for any other parts damaged as a result, it is necessary to keep detailed records. These should document any work previously done while under warranty, show exactly how and when the part malfunctioned, as well as how it affected or damaged any other parts. The more documentation there is showing that proper care has been maintained, the greater the likelihood that the manufacturer will work with you to resolve the issue. However, all this can be difficult when managing fleets of equipment across large or multiple jobsites in addition to the dozens (or even hundreds) of crew members. These reasons are why it is complex to ensure that each vehicle and piece of equipment receives regular maintenance. Typically, equipment operators and foremen are manually tracking engine hours, any defects or malfunctions, repairs and so on. Regular record logs not only show that the equipment was maintained, but also to prove that any malfunctions and failures were not the result of overuse or negligence, which the manufacturer may refuse to cover. A more efficient way to keep track of equipment maintenance, log failing parts and provide automatic record is by using a telematics system such as AssetOutlook™. Rather than depending on handwritten logs, spreadsheet or whiteboard list, a construction firm can get real-time visibility into the health of their equipment. The solution offers insight into data related to hydraulics, direct engine hours, service level indicators and more than 60 other custom metrics. The office and supervisor are also able to see where their equipment is located at all times, and even set up virtual boundaries to trigger alerts. With easy access via detailed reports and a configurable dashboard, contractors will have accurate documentation as part of any warranty claim. They can also set up automatic alerts to inform relevant crew and supervisors about any potential equipment problems before or as they occur. This information will make it easier to practice preventative maintenance and catch any potential defects before they can cause significant damage. Managing warranties for large mixed construction fleets is often a time-consuming manual task. 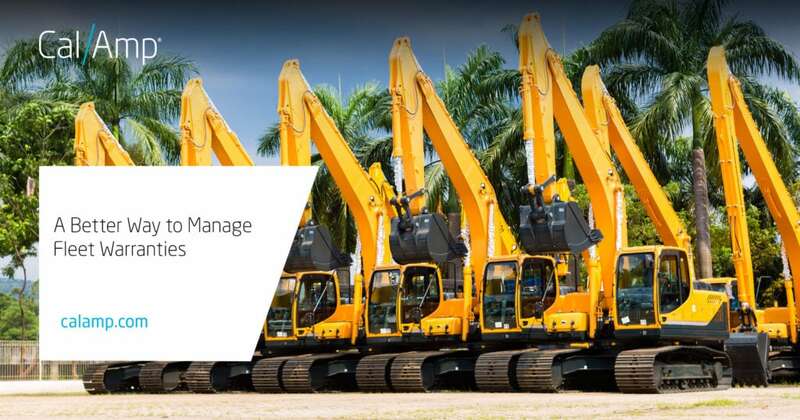 However, implementing a telematics solution such as AssetOutlook™ helps automate and streamline the process of tracking the health of heavy equipment and vehicles. The result is maintenance that is more efficient and deployment of assets that fall under a warranty. To learn more about CalAmp’s solutions for fleets and construction, visit calamp.com/solutions/.